I will Update this as much as possible. It seems that things start to look more and more like the Romanian revolution in ’89. PLEASE SIGN THE PETITION TO HELP OUR BROTHERS AND NEIGHBOURS! CLICK HERE TO SIGN PETITION! So far over 6000 people signed. Join the cause! Live from the protests here. More information about yesterdays events here. Pictures about what is now happening can be found on this site. A very good link where you can find the latest news and oppinions can be found here. More news in romanian newspaper Adevarul. The Romanian Ambasador is now a „Persona non-grata”, according to Voronin. He has 24 hours to leave the country. 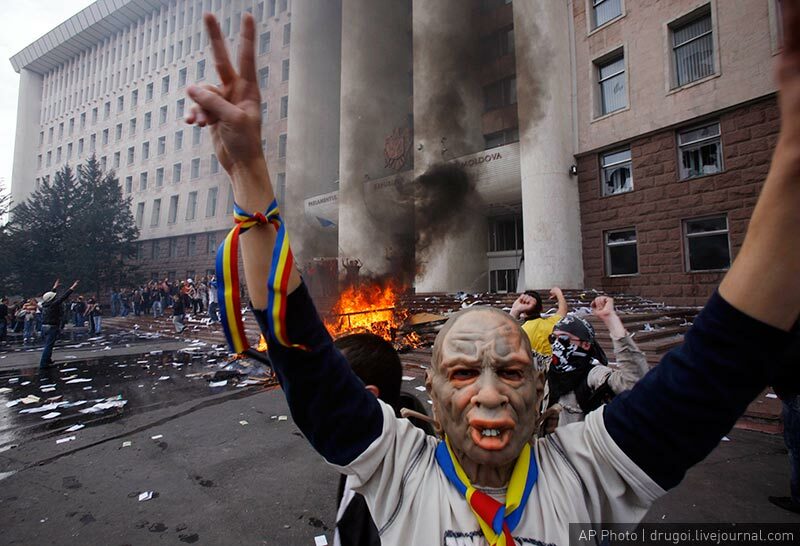 Voronin acuses Romania for the protests. Details here. Romanians now need visas to get into Moldova.Details here. The borders are still closed. Hundreds of Moldavian students can’t get in their own country. Moldavian cops are breaking rocks in order to defend from the raging protestants. Video. The New York Times news Here. Protests now in Paris in front of the Moldavian Embassy Video. More and more people agree that they need to take over the National Television in Moldavia. This message has to go through and reach them. Baroness Emma Nicholson substantially disagrees with OSCE Moldavian elections report. Details Here. Protests now in Strasbourg . Video. This entry was posted on aprilie 8, 2009 at 11:33 am and is filed under Generale with tags 1989, BBC, Chisinau, CNN, Comunism, Comunists, Moldavia, Moldova, News, Noutati, Revolutie, Revolution. You can follow any responses to this entry through the RSS 2.0 feed. You can leave a response, or trackback from your own site.